This beach on the north coast of Alagoas is considered to be the jewel in the crown of Northeast Brazilian beaches. Barra de Santa Antonio, 44 kilometers (27 miles) north from Maceió, grew out of a 17th century Dutch village. The town is split by the Rio Santo Antonio, with government offices and tourist services on the right bank and attractions on the left. Left bank sights include historic buildings, such as Igreja de Nossa Senhora da Conceiҫão church, and natural wonders like llha da Croa island. The town is famous for its Carnival and festas Juninas, São João festivities. Additional merry-making occurs in September welcoming the summer season. And in January townsfolk honor their patron saint, Saint Sebastian. Praia de Carro Quebrado beach, surrounded by many-colored cliffs, is considered one of the Northeast's splendors. Ilha da Croa is hardly an accurate name; the " island" is actually a peninsula peppered with natural pools and defined by a line of reefs. The peninsula stretches into the water near the town's historic district. A car ferry and several passenger boats are available for those who want to make the 5 minute trip across. To visit the town's best-known beach, cross the Santo Antonio River to Croa Island. From there, follow 6 kilometers (4 miles) of unsigned, coconut tree-lined dirt road to the beach. Local kids are happy to serve as guides as long as they're rewarded with a bit of change. It's a good idea to let one just in your car and show the way. The beach's striking sand cliffs shade from deep purple to beige. If time (ample) and tides (Iow) allow, consider extending your trip to the cliffs and clear waters of Praia do Morro and Praia da Pedra do Cebola. Praia de Tabuba, 4 kilometers (2.5 miles) from Barra de Santo Antonio, is situated at the mouth of the Sapucaí River. Natural pools and exceptionally clear water await visitors. The soft, brilliant white sand is perfect for sunbathing. On clear days, sailing rafts called jangada depart from the beach to take visitors for a pleasant spin. 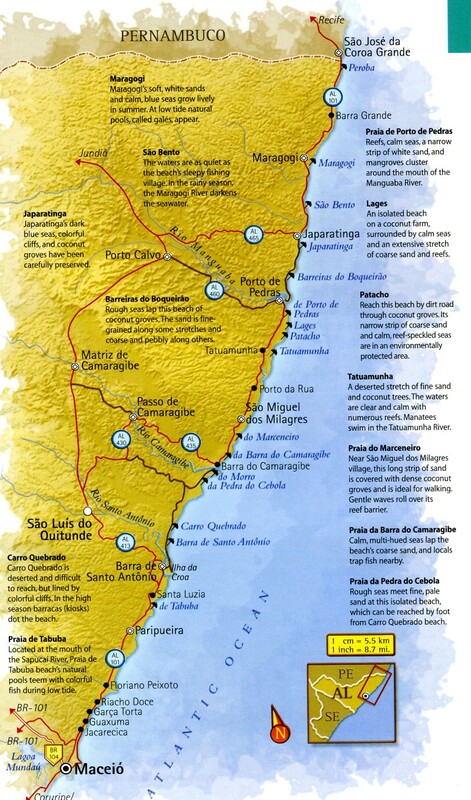 The history of tiny São Miguel dos Milagres, 108 kilometers (67 miles) north from Maceió, is cloaked in legend. It is said that a fisherman found a statue of São Miguel Arcanjo (Saint Michael the Archangel), which cured him of a serious illness. True or not, the fact remains that the old settlement of Nossa Senhora, originally a center of anti-Dutch resistance, became a village at the beginning of the 19th century, taking the name of its patron saint. Today its quiet pace is complemented by its beautiful beaches and calm, crystal clear waters. Jangadas glide by in a picture of unfaltering tranquility. Praia de Porto de Pedras is 15 kilometers (9 miles) from the center of São Miguel dos Milagres. Other nearby beaches worth visiting include Tatuamunha, Patacho, and Lages. This town, 115 kilometers (71 miles) north from Maceió and near the city of Maragogi , boasts spectacular beaches. Barreiras do Boqueirão is the last beach of the Rota Ecológica (Ecological Route), which also includes São Miguel dos Milagres, Porto de Pedras, and Passo de Camaragibe. Freshwater springs line the road leading to coconut-fringed Barreiras do Boqueirão, earning the beach the nickname Praia das Bicas ("Spring Beach"). When the weather is hot, the springs can be extremely crowded. Postcard-perfect Maragogi is halfway between Recife and Maceió, 130 kilometers (81 miles) from both. After Maceió, it's Alagoas' most popular tourist destination. At the center of the Costa dos Corais ("Coral Coast"), the city is draped with beaches, coconut trees, and coral reefs. It takes its name from the river that borders it, but before I892 it was also called "Gamela" and "Isabel". Though noted for its resistance to the Dutch occupation, the town today is renowned for its warm hospitality toward all visitors (even those of Dutch ancestry). Day trippers head for the galés (natural pools) and to São Bento village to try the local specialty, bolo de goma (cornstarch cookies). Lively Praia de Maragogi is hemmed in by hotels, guesthouses, restaurants, and craft stores. Sun worshipping throngs soak up the natural beauty and take boat trips from the shore. If you'd prefer quiet, head 4 kilometers (2.5 miles) toward Recife to Praia de São Bento. It's the first beach you see after crossing the Rio Salgado, which separates Japaratinga from Maragogi. Tranquil Peroba, 12 kilo meters (7 miles) from Maragogi, entices visitors to kick back amid coconut trees, natural pools, and intensely blue waters. On the border with Pernambuco, the beach lacks for bars and restaurants but is home to an increasing number of guesthouses. Alagoas's signature natural pools, the gales, are 6 kilometers (4 miles) from the coast by motorboat or catamaran. The pools are known for their uniquely large size. Their crystal-clear waters reflect white coral-speckled sand and teem with fish. Feed the fish only with food approved by Ibama (the Brazilian Institute of Environment and Renewable Natural Resources), which young boys sell on the beach. São Bento village is the capital of bolo de goma (cornstarch cookies), a traditional treat similar to the sequinhos eaten in the south of Brazi l.
Guesthouses, bars, and shops display bags of the little shell shaped temptations. Entire families are often dedicated to the production of this delicacy, whose origins date to the Dutch invasion.